EvitaWorks is a family workshop in Europe, of painter Eva Campbell with her husband, Alex. Our paintings and crafts are on display in private collections all around the world. An extensive art portfolio is available at the gallery. – Bulgarian Academy of Theater and Film Arts – specialized in Fashion Design. A multidisciplinary subject, with a strong focus in drawing, painting and design; supplemented with acting, fashion photography and dance. 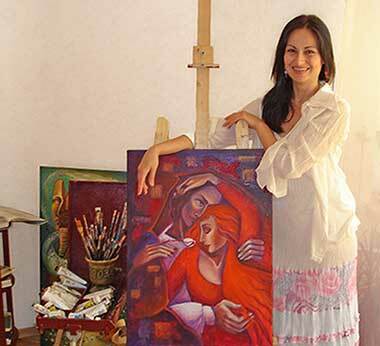 – Fine Art School, with intensive training in painting, drawing, sculpture.